Keurig Elite K40 As Low As $74 + FREE Shipping (After $25 Gift Card)! You are here: Home / Great Deals / Keurig Elite K40 As Low As $74 + FREE Shipping (After $25 Gift Card)! 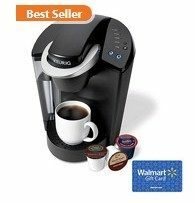 Walmart Cyber Monday Deals have already started, and right now you can score this awesome Keurig Elite K40 for As Low As $74 + FREE Shipping (After $25 Gift Card)! I have this one in white and LOVE it! It’s $99 currently, however, you will get a FREE $25 Walmart gift card!